Richard tries to escape the pursuing balls of light by maneuvering the hovercraft in various directions, but the strange creatures cannot be shaken. The Chosen One turns to Robo, who is still immobile, and he suddenly gets a brainwave. Remembering when Robo plugged his arm into the hovercraft's socket, Richard takes Robo's arm and repeats the action. Suddenly, a shower of dense steam appears out of nowhere and covers Richard, and he notices quickly that the steam is incredibly cold. 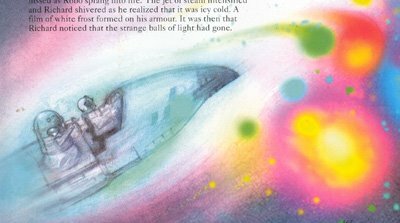 But before he could complain about the frost on his armor, he notices that the balls of light have disappeared. Confused, Richard turns to Robo, who is "coughing" back to life. 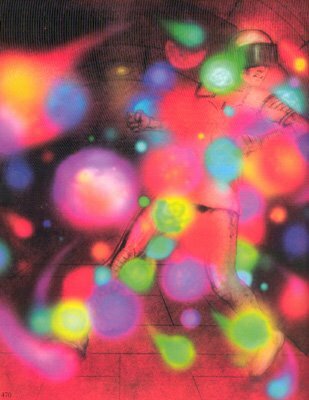 The robot explains that the spheres of light were Pekods, sensory organs of another being that are attracted to high ambient temperatures, and that Robo had used a permabeam to lower Richard's temperature. Richard, while thankful, hopes that they don't see the Pekods again so he won't get blasted by Robo's ice beam again. 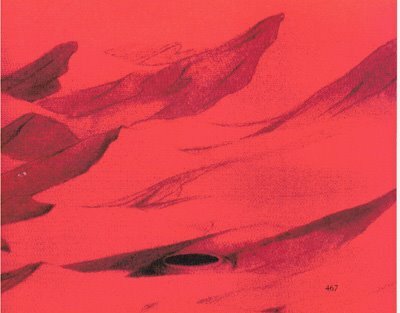 The duo continue flying over the fractured mirror terrain, which eventually morphs into a massive red desert that seems to be made out of plastic particles. As they fly over the dunes, Richard notices a new binary message on Robo's control panel. Curious, Richard asks Robo where the messages come from; Robo replies that he doesn't know because his memory banks were damaged by the acid attack. When Richard inquires how Robo knows where the Cyber Dimension exit is, Robo gives the same response. It was then that Richard notices something on the ground below them. At first concerned, he is relieved to see it is nothing more than a small hole in the plastic desert. But his relief is short-lived when an invisible force from the hole suddenly grabs Richard and pulls him down towards it. Richard tries to grab Robo but is too late to do anything. The hovercraft and Robo recede into the distance as Richard falls faster and faster until he is swallowed by the hole, where he continues his descent into increasing darkness. As he falls, he sees strange objects floating in the darkness around him. He tries to reach out and touch one, but he pulls his hand back when the luminous object snarls at him to reveal razaor sharp teeth. His journey comes to a sudden end when he lands on a massive pile of plastic sand at the bottom. When he manages to get up, he notices he is in a tunnel. He hears a noise in the distance, like a mechanized drumming. Deciding to look around, he spies one end of the tunnel that leads to a distant and faint light. He follows this light until he emerges in a large room lit up with a fluorescent red glow. He finds something familiar about the place, and then he abruptly realizes that he recognizes the smell as the same odor given off by the Pekods. To confirm his suspicions, countless balls of light suddenly flood the chamber. Richards tries to run away, but the Pekods swarm over him and pin him to where he stands. He struggles, but the grip of the balls of light is too strong, and the Pekods begin forcing him in the direction of another tunnel. Despite their forcing him to move, Richard realizes that the balls do not wish to harm him, and begrudgingly decides to let them take him wherever they're leading him. 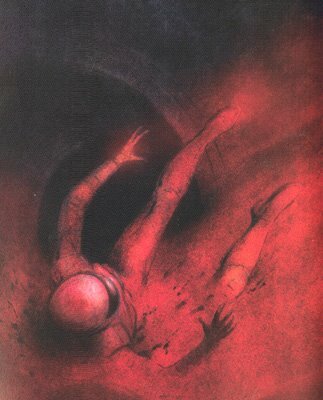 Eventually the Pekods take him to another chamber, where they drop him and disappear down another tunnel. Richard sees the source of the loud noise from earlier: a series of machinies lining the chamber's walls. As he nervously waits in the chamber, he hears another sound. To his horror, he recognizes the sound of footsteps belonging to something enormous. Suddenly, a fierce red light envelopes the cavern as a monstrous creature enters. The creature identifies itself as Mortex and demands to know who has entered its citadel. The creature seems to be made of molten metal, and its hands were massive pincers. Mortex towers over Richard and examines him closely, immediately recognizing Richard as the Chosen One. Richard backs away and draws his sword, but Mortex only laughs, claiming Richard wants to play with him. Mortex fires several fireballs at Richard, who dodges them easily, causing Mortex to laugh in delight. Richard remembers Robo's message, but doesn't know how it will help him. Mortex fires a white beam of light from between his eyes, which hits Richard and lifts him into the air. Mortex gleefully announces that the Evil one will be pleased to see his prize. In desperation, Richard throws his sword at Mortex, striking the creature dead on and causing it to drop Richard to the ground. But Mortex seems happy at the competition, and doesn't appear all that concerned when Richard picks up his sword and dashes past Mortex into another tunnel. With Mortex toying with Richard, the Chosen One races down the tunnel and emerges in what appears to be a control room. Not knowing what else to do, he starts haphazardly throwing switches and pressing buttons. Mortex, upon entering the control room, suddenly grows serious as he screams for the Chosen One not to touch anything, almost in a pleading tone. Not listening, Richard continues throwing switches in a desperate attempt to find a way out of the room. Just as Mortex screams for him not to touch a specific button, Richard presses it and the room above the molten creature collapses. Light bursts into the room as plastic sand falls into the chamber on top of Mortex, burying him and melting to the creature's body. Richard, partially buried himself, watches as Mortex struggles with the plastic coating when a metallic rope dangles from the hole above. It's Robo, hovering above the hole with a harness. The Chosen One grabs the rope and Robo begins to hoist him upward. As he is lifted, Richard takes one more look at Mortex, who has ceased his struggle and lies still. Richard recalls the binary message and realizes that the melted plastic had cut off Mortex's oxygen supply, thereby snuffing out his fire. Robo continues to hoist Richard out of the underground citadel when suddenly there is a loud explosion. Beneath them, as Mortex's lair begins to disintegrate, a jet of flame begins to rise from below, threatening to engulf the dangling Chosen One. Richard urges Robo to hoist him faster, as his grip on the harness slowly begins to loosen. 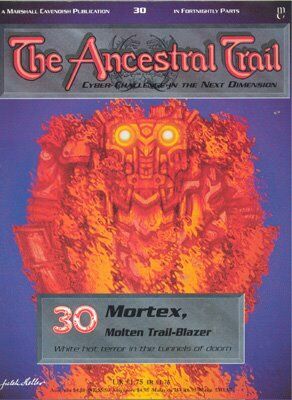 The thirtieth issue of The Ancestral Trail introduces us to Mortex, the first main issue creature that has direct ties to the Evil One. The first two creatures - Tengam and Zenon - were similar to Hulkan and Stridor in that they were terrible creatures that already existed in the world, and Flector, while likely having some connection to the Evil One, didn't speak and therefore couldn't confirm this suspicion. Mortex, on the other hand, explicitly declares his allegiance to the Cyber Dimension's lord, which makes it clear that the Evil One knows that Richard is in his world (if the Broon android didn't already make that clear enough). Concerning this issue, there is an interesting contrast between the cover image of Mortex and the image used inside the issue's pages. The cover image shows a crisp and clear view of Mortex against a contrasting purple-blue background, letting us see Mortex's face vividly. The image on the inside, however, shows a Mortex obscured by the heatwave surrounding his molten body, making him almost blinding to look at. The reason for this contrast likely was done because the page version of Mortex would look too blurry to look at for a cover image, so a cleaned up version was used for the cover. While this does work for a cover image, I have to say the blurred, page version of Mortex is the preferred one, as it makes him look menacing and terrifying - something so terrible and twisted that just looking at it is painful.